Oregon Lighthouses are one of our state's most intriguing and beautiful attractions, yet many travelers to the Oregon Coast simply pass them by without realizing there are some great scenic stops, occaisional tours, and even the Heceta Head lighthouse with a Bed and Breakfast in what used to be the keepers quarters. 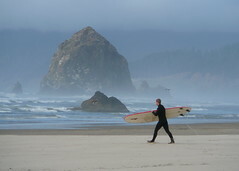 Heceta's Bed and Breakfast will run you a few hundred bucks, but note that a budget traveller can visit the light at Heceta Head and several other lighthouses for free, or go to the North Umpqua Light camping area and enjoy the lighthouse up close and personal for the price of a camping spot. Sam Hill was tonight's special, showcasing a colorful figure from Oregon and Washington history whose vision and persistence, and fortune led to the Columbia River Highway.